Is there such a thing? According to wikihow there is. On this site atheists have taken to evangelizing Christians. (See http://m.wikihow.com/Persuade-a-Christian-to-Become-Atheist) Why would an atheist want to convert me to his religion? The answers range from their desire to take God out of the mainstream, to change the way people think, to impress upon society a philosophy that would transform literature and media, to a point that all will realize that our life has no more meaning than a bugs life—to get us thinking in the now because it is hopeless to believe there is an afterlife. But the real reason that underlies the myriads of others they propose, is their unwillingness to submit to authority other than their own. God is our Creator. He gave us this beautiful world we live in. He gives us the very breath we breathe by sustaining the growth of the plants that give off oxygen. He created us to rule over the earth and to subdue it. So God created man in His own image; in the image of God He created him; male and female He created them. Then God blessed them, and God said to them, "Be fruitful and multiply; fill the earth and subdue it; have dominion over the fish of the sea, over the birds of the air, and over every living thing that moves on the earth." And God said, "See, I have given you every herb that yields seed which is on the face of all the earth, and every tree whose fruit yields seed; to you it shall be for food. Also, to every beast of the earth, to every bird of the air, and to everything that creeps on the earth, in which there is life, I have given every green herb for food"; and it was so. Then God saw everything that He had made, and indeed it was very good. So the evening and the morning were the sixth day. God was so good to mankind that in those beginning days, all that was necessary to sustain a fruitful and healthy life was present. He provided everything for us. The earth willingly produced all of the food and sustenance that was needed. All Adam needed to do was give it some TLC. No thorns, no weeds, and no hindrances were present to impede the provisioning of the Lord ... that my friend is how good our God is. The world we live in is not our own. Humanity does not own it. We are sharecroppers in this life, tending to what He has provided. To God alone we are accountable. However, when sin infiltrated our world we ran after it, and we placed our allegiance in another who was not the Creator—one who did not provide the things freely enjoyed. Rather, we followed one who lives to corrupt it. The Bible describes this enemy of God as Satan, the great deceiver. Soon the earth became corrupt, just like him. The sin he helped to promote, in the heart of humanity, soon produced its fruit; before long, weeds began to appear. God, who is just, allowed us to follow this imposter, this other master—the master of deceit. He allowed this because He loves us so much that He would not force our affections toward him. Instead, He has allowed us to reap the fruit of the other master—that we chose to follow. God did not take away the good things He provided, He only allowed the seeds of the wicked one to grow up amongst them. These seeds began to make things very difficult for our first parents. The curse on earth was now in full force. But isn't that what a humanity-without-God wanted? So in reality, our allegiance has been misdirected and we have been all-to-often following the wrong master. But God's desire for us to love Him has never changed. When we do this willingly, by our own accord, through confession of our errors (sin), in response to the heartfelt invitation of the Lord—to take back the reigns of our life—He then willingly comes in to dine in our homes. Behold, I stand at the door and knock. If anyone hears My voice and opens the door, I will come in to him and dine with him, and he with Me. Atheists have taken up the cause of the other master. Their doctrines of death tell us there is no God. He did not create the world around us, and He certainly does not sustain its existence. Therefore we are only accountable to ourselves, and by proxy, the master who spun the lie they believe—Satan. Of course they would not accept this truth. It was in the Garden of Beauty and Provision (Eden), that place that God so carefully prepared for the good of mankind, that Satan spun his lie. His exact words were, "You will not surely die" (Gen. 3:4). This was in response to God's command that in refusing to be sharecroppers in his earth we would be subject to the penalty of death; not because God desired us to die, but because He knew that we could not sustain life by ourselves. In short, we cannot create life. We can only manipulate what He set forth into being. God has given mankind just enough creative intellect to destroy ourselves. 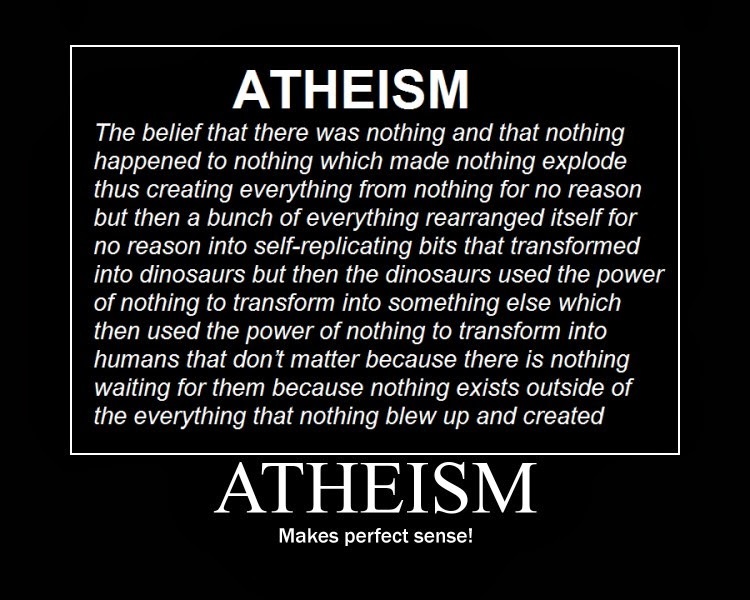 Atheism would like to think differently. But I have yet to see one atheist that could create life from nothing. I have yet to see one atheist with the ability to take every element that makes up the human body from the dust of the earth, shape it into a man with man's likeness, both internal and external, then breathe life into its nostrils and watch it live. You know why they can't? It's simple, we did not write the instruction manual—we are not the Potter ... we are the clay. We are the created ones (ADAM), and Jesus is our source of life. God forbid that I or any other would worship an Atheist or the flawed deceptive teaching they proffer. Their philosophy is a road to nowhere. Just ask them about the end of life. What you will get is, we die and that's it. What they are really saying is we are nothing; we came about by a fluke, and because of that, there is no real value in life—all emotional sentiment and morality is just a product of man and not God. That is a deceptive lie. I Believe Jesus!! Because I believe in Jesus I will obtain Eternal Life forever. Won't you choose the right choice as well? You say there is no way He could love me for all the things I have done. That's what Satan would like you to believe because it keeps you in his control. But when Jesus died on the cross He died for all sin—there is no sin that is greater than His grace. If that emptiness you feel inside seems to have no answers it's because you have been looking in the wrong place—you need to seek Jesus. My Friend all you need to do is trust His word and tell Him you do in prayer. Confess Him as Lord and ask Him to be your Savior. He will turn heaven upside down for you!! That's a promise. Hi, my name is Mike and I am currently working on a book called, 'How to Debate Atheists.' I have completed the first three chapters and would appreciate any feedback.